Like the title suggests, Olly Murs has never been… sorry we just couldn’t finish that sentence with a straight face. 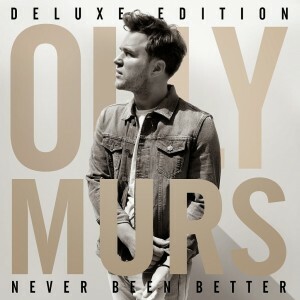 Olly’s fourth album ‘Never Been Better’ really ought to be called ‘More Of The Same’. Or perhaps more aptly “If It Ain’t Broke…’ Not that there’s anything wrong with sticking to a formula that works, but when there’s only a handful of standout tracks, resentment starts to build. First single ‘Wrapped Up’ is quite a catchy pop number with strings. Then again so was ‘Troublemaker’, his last lead single. It also sounds a fair bit like ‘Treasure’ by Bruno Mars, but as one of the best songs of 2013, it’s not exactly a bad song to replicate! Of course there are quite a few ballads present, the best of which is ‘Nothing Without You’. There’s nothing exceptional about it but it’s pretty, which is always nice. Next single, the Demi Lovato duet ‘Up’, is just indie-influenced enough to get some airplay but it’s neither of their best moments. In better news, the dancy John Newman offcut ‘Stick With Me’ is a nice little pick-me-up midway through the album. ‘Can’t Say No’ and ‘We Still Love’ both flirt with being good at times before settling with average. We reckon bonus track ‘Us Against the World’ actually reaches the good mark with its funky tonk piano, strings and pure pop chorus. If the title track is a lyrical sequel to ‘Army Of Two’, this is the musical sequel. To give Olly some credit, he’s openly admitted that he doesn’t want to change anything about his sound. In that respect, ‘Never Been Better’ is a triumph… Seventeen tracks that are generic enough to get radio play. That being said, it’s always a bit of shame when an album is snapshot of commercial necessity rather than of artistic growth. If even major stars like Taylor and Ed can produce albums that take chances whilst staying within a commercial comfort zone, surely Olly could have given us a couple of interesting/experimental album tracks? Download : Wrapped Up, Us Against the World. I don’t get the “never been” joke at the beginning of the review?